I am a nostalgic kind of person and believe it or not, one thing I sometimes like to “reminisce” about is how websites used to look like when the internet was in its commercial infancy. I remember gawking at some of the websites I would visit in 1998, being impressed by the complicated designs, the layouts and the attractive visuals (it was WAY cooler when those visuals moved too. WOW!). Of course, looking back now, websites from the late nineties pretty much fall in the 1970’s “orange shag carpet on the walls and ceilings” category. Someone had to think it looked good at some point–right? 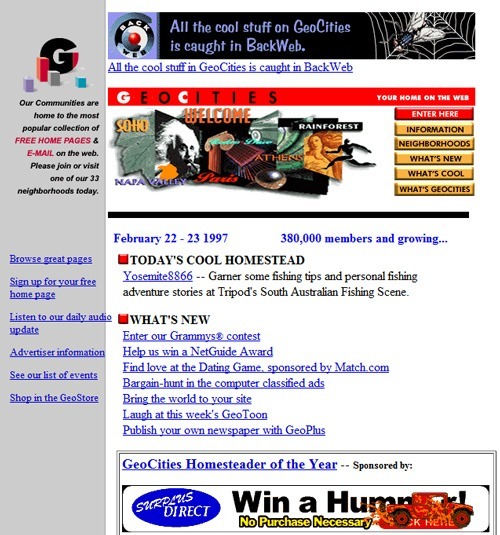 Let’s go down memory lane a bit here and take glimpse at a couple of websites from the late 1990s. Today, we’ll be traveling through time using the Way Back Machine, thanks to archive.org. I don’t know if it’s just me or the exclamation point, but Google seemed much more excited about delivering search results back in 1998. The letters are definitely thicker, rounder and more Crayon-like—reminiscent of a first-grade classroom. Granted, this particular view of the website is really early on Google’s lifetime: several months later, Google ditched the exclamation point, the extra use of turqouise-ish colors and the now obvious statement that Google(!) is, in fact, a search engine. 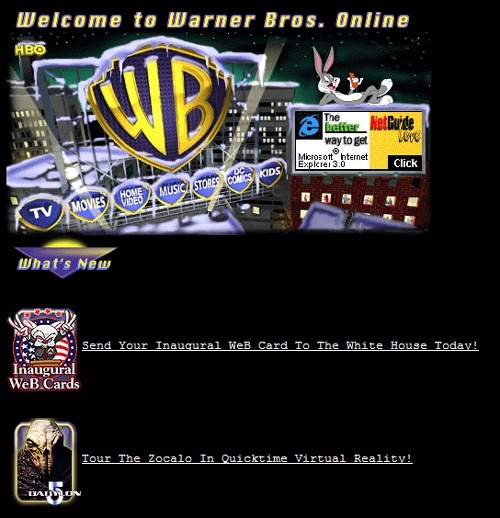 Oh yes, we all know what this site is: Warner Bros.–The big commercial entertainment giant. 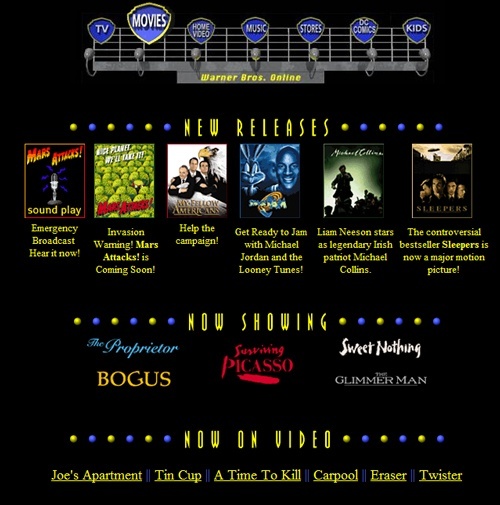 Does their website from 1996-1998 look like a million bucks, just like their movies? Nope. One thing that really seemed hip in the 90s (and I did it too), was to create websites on a completely black background. Throw up some ultra-low res pics (people were on dial-up back then) and a couple of text links, and you were set to go. You can’t see it in the picture above, but if you wanted to be really hip, make a majority of your graphics animated GIFs. The Warner Bros. movie page is covered in them–it’s almost seizure inducing. Now defunct, but it had a good run, right? However, their website from the late 1990s looked pretty typical for the decade. Nothing like blue on gray for your left-nav bar to really spruce things up. Nowadays, most sites are moving away from that standard blue text link. It just seems too cliché, right? 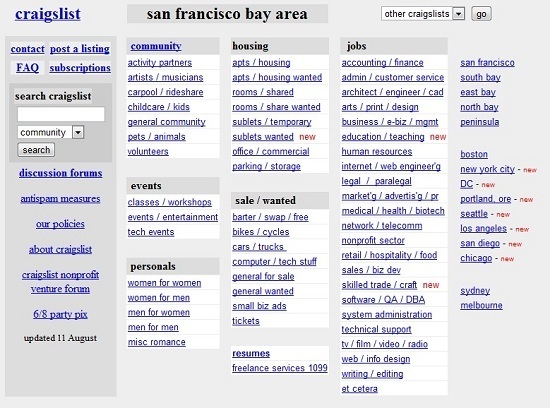 This picture of Craigslist was pulled from 2000. What astonishes me the most about Craigslist is that it just hasn’t changed very much at all in the past ten years. Craigslist operates similarly to Google with the notion that simplicity is king. Sure, Craigslist is simple, but frankly, at times I do wonder if ten years is enough without a decent graphic overhaul. But, what do I know? Craigslist is obviously insanely popular for reasons other than its design. Can you imagine what we’ll think of the websites we’re building now in 10 years or so? In all seriousness, the Internet has come such a long way in the past ten years and it will only continue to grow. Probably in ways we never have imagined. Isn’t technology simply amazing?